Similarly, the CES is an online money and banking system and trading marketplace that tracks credits and debits. While LETS function as clubs that set their own guidelines, CES is administered through an online program that connects local groups to create a global network. The CES website points to more than 100 exchanges in 15 countries. Squires says the Internet has made alternative forms of exchange more viable, as databases can keep account of credits. In the rarefied world of monetary theory, think tanks are abuzz with ideas about future forms of money. One visionary, Jean-Francois Noubel, co-founder of AOL-France, foresees "millions of free currencies circulating on the Net and through our cell phones" as money follows the distribution path that media have over the past decade. Bernard Lietaer, a Belgian economist and author who helped develop the euro, has proposed the Terra, a transnational currency backed by established commodities that would coexist with conventional notes, the monetary equivalent of Esperanto. In recent years, the impetus for alternative currencies in established economies has stemmed in part from localization movements. Periodically ditching the dollar (or the pound or the yen) in favor of homegrown currency doesn't merely fortify the local economy; it also builds community. People have a stake in their neighbor's well-being because that neighbor represents both market and supply chain. Some argue that such transactions are more secure than others because knowing the person you're dealing with, and his family and friends, serves as a kind of social collateral. The use of BerkShares has helped solidify local ties, says Witt. "It's cash, so you have to pay your bills by walking into the store or dentist's office." Local pride does have its challenges, however. In September the town of Lewes in Sussex, England, issued the Lewes Pound  complete with a special-edition beer from Harvey's, a local brewery, to celebrate the introduction. There was an immediate run on the currency, limiting its circulation; Lewes Pounds were going for 35 pounds sterling on eBay. The organizers quickly went back to press and dealt with the situation. As Witt is the first to say, "Local currencies are not easy." Some are moved to create currencies for environmental reasons: they minimize the use of energy. With diminishing oil supplies, "we will not be able to move goods around the world as cheaply," says North. One strategy, he says, is to produce more locally, and a way to facilitate that is through local currency. This was one inspiration for the Lewes Pound and for the Totnes Pound in Devon, England. Both towns are part of the Transition Town movement, which seeks creative, upbeat, community-based approaches to dealing with climate change and diminished oil reserves. 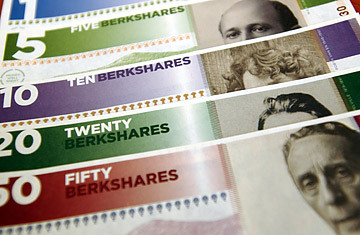 Paper-money currencies, like BerkShares or the Lewes or Totnes Pound, slip fairly seamlessly into the national economy; their use is taxed like ordinary money. More abstract exchanges are a bit more complicated to deal with. But the tax concern is not insurmountable. "If you use local currency for your main income-generating activity, you must pay income tax," says Hensch, who consults in complementary currencies. Likewise, if you have a business, you'll pay sales tax on any local currency  in New Zealand, that would be Green Dollars, part of LETS  you bring in. But if you trade in "neighborhood help," like lawn-mowing, that would not be taxed. The rules vary from country to country. In the U.S., any business transaction must be recorded and reported to the IRS; tax levies apply as if the trade were made in cash. As Squires puts it, professional services are subject to income tax, but for noncommercial transactions, barter rules hold. "If I bake a cake for you, that's not a taxable event," he says. Andrew Rose, Bernard T. Rocca Professor of International Trade at the Haas School of Business at the University of California, Berkeley, sees local currencies as limited by their unwieldiness. "Money is primarily just a convenience for enabling exchanges between two parties. The more widely accepted, the more convenient it is," he says. If you need to use different currencies in different locations, the money then becomes less convenient. Do large financial institutions have anything to fear from the use of alternative currencies? Not at all, says Rose. "It's got to be so tiny. It has no effect at all," he says. Besides, he notes, the Fed doesn't care about currency or even the number of bills circulating in the economy. "The Fed cares about monetary policy and deal[s] with that in different ways." See TIME's 2008 luxury index.